Look at who I found wearing Stella & Dot! Elizabeth Banks! Don't you just love her in The Hunger Games and Pitch Perfect? She is quite the actress. 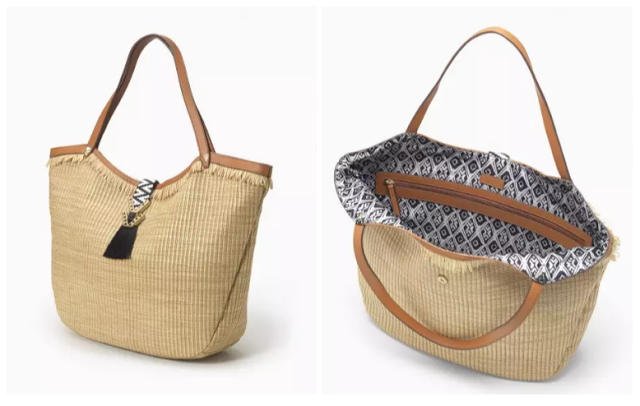 On her Instagram feed I noticed she was rockin the Stella & Dot Riviera Tote in Raffia Fringe. The bag has a tribal inspired flap over a ribbon with fringe and gold hardware, perfect for a day at the beach or taking a stroll. Grab Elizabeth's bag by shopping online, hosting a style session or joining me as a Stylist. My wife could use this. She always carries a book, crossword puzzles and water everywhere she goes. Yes! That bag is just perfect for a day at the beach, shopping, picnics or every day use. I have two S&D totes and love them. The one she's carrying is super cute though and much different from mine. Pretty beautiful! I think the same as Dreammer, it's perfect for the beach but these days girls are super creative so I think it can be used everywhere. I know, this bag is awesome! It is actually on my to-buy-list, I love S & D! Blessings! I can't say no to a bag like that, it's the perfect bag for the summer. I love the design because it looks really stylish and sturdy. This is a very pretty summer handbag. Love the straw design. What a gorgeous bag... I can see this with me on the beach on my next holiday!! Easy beach bag it is like everyone pointed out, every lady should have this. I am not a huge fan of bags, but I would love to have those for certain special occassions. They are really cool and chic looking and would go with any kind of dresses , casuals or formals.